A sun drenched Shoreditch park plays host to a spectacle of youthful exuberance and reckless abandon on Saturday evening, as Swim Deep cap off the first ever Old Blue Last Festival with a set littered with glistening reverb and psychedelic synths. Described as a “fun, inexpensive, sunny day out” on the bar’s Facebook page, The Old Blue Last Festival delivers on all three of its promises thanks in part to the miniature heatwave currently sweeping the country, and with tickets costing just five pounds, the event is well attended but surprisingly not sold out. Lou E, Shame, The Black Tambourines and Johnny Lloyd occupy the day’s early slots, with the former Tribes frontman standing out in particular playing hits off his debut Dreamland EP. Three piece alternative rock band Happyness are also impressive in their energetic but short-lived 30 minute or so slot early in the evening. 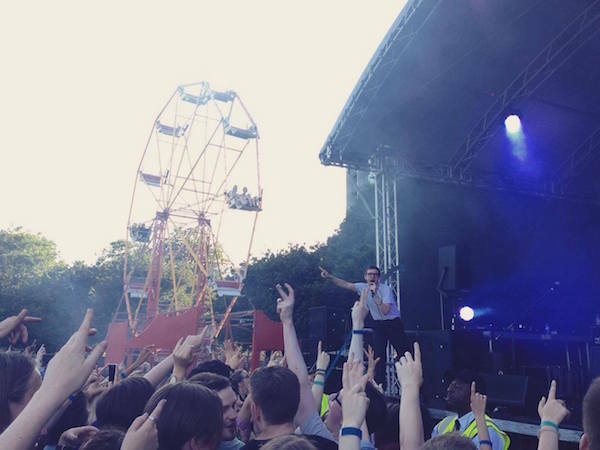 However, it is Spector who steal the limelight with the day’s best performance in the festival’s sub-headline slot. The five-piece indie rock band stride confidently on stage to rapturous applause and blitz through a forty-five minute set packed with tracks from their latest album Moth Boys and 2012 debut Enjoy it While it Lasts. Fred Macpherson, Spector’s enigmatic frontman, dominates proceedings, hurling through the opening tracks – ‘Bad Boyfriend’ and ‘Decade of Decay’ straight into ‘Twenty Nothing’ at breakneck pace. Lyrically, Spector have developed immensely as a band since their early days, and ‘Stay High’ is testament to this. “In a world that doesn’t add up we are equals, bonding over hating people,” Macpherson offers on ‘Stay High,’ the last single from Moth Boys, tongue pressed firmly to his cheek, basking in the bond his band have with their adoring fans. Old favourites “Celestine” and “Night, Don't Ever Let It End” provoke mosh-pits in some parts of the crowd, but the majority of the audience are too captivated by Macpherson’s stage presence and showmanship. Even lesser known track ‘Reeperbahn’ is sung by the crowd at almost earsplitting volume. Debut single ‘Chevvy Thunder’ still brings the biggest cheer of the evening but shows its age at times, paling in comparison to the band’s newer and more sophisticated material. The band finish with a rousing rendition of “All The Sad Young Men” before departing having set the bar for close friends Swim Deep very high indeed. Forty-five minutes or so later, the Birmingham entourage make a low key entrance with ‘Francisco’ from the 2013 Where the Heaven Are We. Austin Williams and co. are famed for their languid and carefree stylings, and today is no exception. Baggy, lazy rifts and dreamy keys dominate on ‘You Make My Sun Shine’ and ‘The Sea’, “Don’t just dream in your sleep it’s just lazy” muses Williams dazily on ‘Honey’, before upping the ante with ‘Grand Affection’ and “One Great Song’ from the five-piece’s 2015 release Mothers. All in all, The Old Blue Last Festival was a resounding success and the perfect example of how festivals can and should be run. Good bands, good value for money, and (if you’re lucky) good weather. Same time again next year, yeah lads?